The GoWISE USA electric digital air fryer with button guard and detachable basket – 2.75 QT is just perfect for singles or couples. This 4-in-1 multi-cooker can fry, grill, bake or roast; great for those with limited kitchen space. You’ll just need this single appliance for your cooking needs. Easy to use and easy to clean, eating home cooked healthy low fat meals is just a button press away. Being compact in size, this will be the air fryer for you if you do not have much counter space. 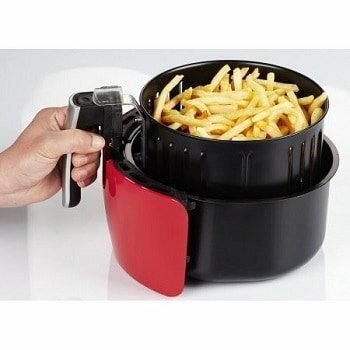 This small capacity air fryer is best for 1 person cooking needs. The 2nd generation manual model (GW22622) is only available in black and has a larger capacity of 3.7 qt. 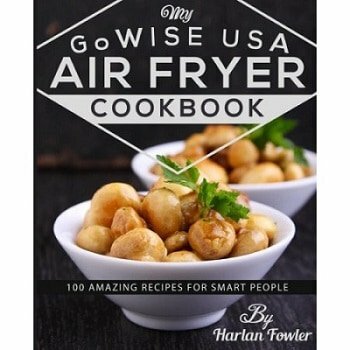 This Gowise air fryer model has the smallest capacity among its different air fryer models. The Gowise XL digital air fryer has a large 5.8 qt capacity. With a 2.75 qt capacity, it is just right for those staying alone. You can get 2 portions of food air fried in its cooking basket. The basket measures 3 3/4″ in height and 7 1/2″ in diameter. You can fit in 2 chicken pieces, 4 -5 wings, 2 salmon fillets, 5 pieces of spring rolls or 17.5 oz of French fries for best results. Overfilling the basket will result in uneven cooking. Cakes or liquid food will need the baking cake pan or oven dish provided these fit into the cooking basket. Gowise does have their own brand baking dish but it is too big to fit into this fryer. Certain small cut foods such as French fries need to be shaken halfway through the cooking process. This is to ensure even cooking and browning. It will only take between 10 – 20 minutes depending on the thickness of your fries. A piece of juicy steak will take about 10 – 12 minutes at a temperature of 360°F. With the air fryer, left over food will not be wasted. Reheating your pizza takes about 10 minutes at a temperature of 150°F. The non-stick fryer basket sits on a drawer/pot whereby excess oil from the food drips out onto the drawer/pot below. Mess is at a minimum. Rapid air technology involves hot air moving rapidly in all directions inside the cooking chamber of the air frying machine. Due to small size of the chamber and the high heat of the air inside, food cooks fast sealing in the juices. Resulting fried food is moist and tender. You will find most food ingredients finish cooking within 20 minutes – fast, convenient and hassle-free. The LCD display screen shows clearly the temperature and time. The power button is in the center. You get the plus/minus buttons for controlling the time on the left side of the power button. The plus/minus button for the temperature control is on the right of the power button. When the machine is switched on, the fan icon will start rotating. For this particular model, there is no red lighted button displayed in the center of the fan icon unlike the other models. Temperature ranges from 175°F – 400°F. Timer is set for a maximum of 30 minutes. When cooking French fries, frozen chicken nuggets or muffins, the temperature is best set at 400°F. For chicken breast or drumsticks, try setting at about 320 – 360°F. Try baking buttered salmon at 350°F for about 15 minutes for your delicious golden crusted salmon lunch/dinner. Stuffed vegetables can be grilled at a temperature of 320°F. Remember, the size and thickness of the cut ingredients will affect the cooking time and temperature. As with all the Gowise air fryers, the fryer basket comes with a button guard. You have to press the release button (which is covered by the button guard) before the basket detaches from the inner drawer/pot. This prevents accidental dropping of the basket when pulling it out from the fryer. Timer will alert you when cooking is completed. It will beep 5 times. The machine will then go into standby mode. There’s no danger of overcooking of the food. All Gowise air fryers are ETL certified, meaning they conform to North American safety features. The basket and drawer are non sick and easy to clean. The fryer basket is dishwasher safe. It is recommended that the machine is cleaned after every use. There is also a 30 days warranty from day of purchase for the removable basket, pan and other components. If the small capacity of 2.75 qt is suitable for you, then this is a truly value for money air fryer for you. Just like the more expensive models, it can fry, grill, bake or roast, albeit in smaller portions. However, roasting a whole chicken is out. If you’re looking to get one for your college going child or your aged parents, then this is worth considering. Fast and convenient with fuss free cleaning, having your own air fryer for cooking your favorite fries or just a simple grilled sandwich for lunch is certainly more healthy than buying from the corner fast food store.